Officials from the Hamilton County Speedway driven by Spangler Automotive have released an aggressive and exciting tentative schedule of events for the 2019 racing season. On the heels of a wildly successful 2018 campaign, regular Saturday night programs will continue to feature six classes competing in the Summit USRA Weekly Racing Series including the return of the Olsen Family USRA Modifieds, Seneca Foundry USRA Stock Cars, Stein Heating & Cooling USRA B-Mods, Diamond in the Rough USRA Hobby Stocks and USRA Tuners plus regular appearances by the Super Late Models of the Malvern Bank SLMR Series. Two big additions to the 2019 calendar are five special “Friday Night Under the Lights” shows for area racers and the announcement of the 6th Annual Summit USRA Nationals moving to the Webster City dirt oval Wednesday-Saturday, Sept. 25-28. The 2019 season will blast off Saturday, April 20. The Hamilton County Fair takes place Wednesday through Sunday, July 24-28, and we close the curtain on Friday and Saturday, Oct. 25-26, with the 19th running of the Fall Futurity. Saturday, April 20 ... Easter Egg Hunt + Kids Night (Bike Race #1) Presented by D&B Agro Systems. Friday, April 26 ... Friday Night Under the Lights. Saturday, April 27 ... Summit USRA Weekly Racing Series (Modifieds $4,000 to win). Saturday, May 4 ... May the Fourth Be With You (Star Wars Night). Saturday, May 11 ... Teacher Appreciation Night. Friday, May 17 ... Friday Night Under the Lights + Kids Night (Bike Race #2 & Candy Toss) Presented by D&B Agro Systems. Saturday, May 18 ... Armed Forces/Wounded Warriors Night (B-Mods $2,500 to win) Presented by Casey's General Store. Saturday, June 1 ... Ladies Night. Saturday, June 8 ... USMTS + Kids Night (Bike Race #3 & Candy Toss) Presented by D&B Agro Systems. Tuesday-Wednesday, June 11-12 ... Rumble at the River. Saturday, June 15 ... Fan Appreciation Night ($5 Admission) Presented by Stein Heating & Cooling. Friday, June 21 ... Friday Night Under the Lights. Saturday, June 22 ... Hamilton County Peace Officers Night w/ Malvern Bank SLMR Series. Friday, July 12 ... Friday Night Under the Lights + Kids Night (Bike Race #4) + Candy Toss. Saturday, July 13 ... Racer Appreciation Night (get free tickets from drivers). Saturday, July 20 ... Firefighters Appreciation Night (Hobby Stocks $1,500 to win). Wednesday-Sunday, July 24-28 ... Hamilton County Fair (Kids Night + Season Championship July 28). Thursday, Aug. 22 ... USMTS Modifieds + DTRA Dirt Trucks. Wednesday-Saturday, Sept. 25-28 ... 6th Annual Summit USRA Nationals. Saturday, Oct. 5 ... Fall Series + Malvern Bank SLMR Series ($2,000 to win). Saturday, Oct. 12 ... Fall Series. Saturday, Oct. 19 ... Fall Series. Friday-Saturday, Oct. 25-26 ... 19th Annual Fall Futurity + DTRA Dirt Trucks on Saturday. All dates and events are tentative and subject to change without notice. More information regarding weekly and special event tickets, times, featured classes and major events will be forthcoming in the next few weeks. 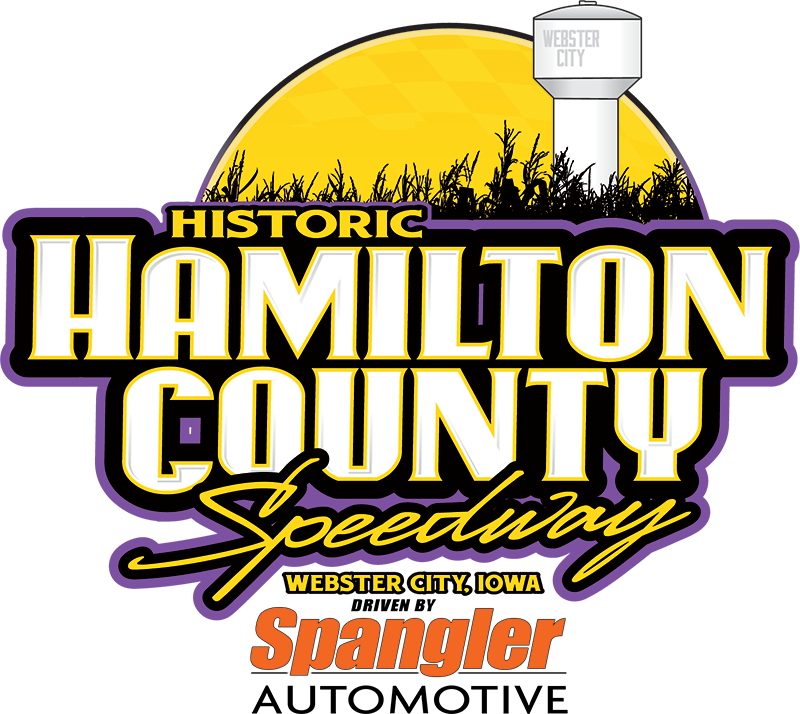 The Hamilton County Speedway driven by Spangler Automotive is located off of US 20 at exit 140, then 1.2 miles north, then 0.5 mile east on Bank St., then 0.4 mile south on Bluff St. to the Hamilton County Fairgrounds in Webster City, Iowa. The physical address is 1200 Bluff St, Webster City, IA 50595. For more information, call (515) 832-6000 or check out www.HamiltonCoSpeedway.com. You can also get social on Facebook at www.facebook.com/RaceWebsterCity or Twitter at www.twitter.com/HamiltonCoSpeed (@HamiltonCoSpeed). Opening in July 1910, the Hamilton County Speedway is the oldest speedway in the state of Iowa. In 1938, work began on the current location at the Hamilton County Fairgrounds. The semi-banked half-mile dirt track was completed in the spring of 1939, and the first races were held on the track in September of that year. HAMILTON COUNTY SPEEDWAY MARKETING PARTNERS: American Family Insurance, Casey’s General Store, D&B Agro-Systems, Daily Freeman-Journal, DCD Concrete Coating, Diamond in the Rough, Dinsdale Auto, Doolittle Oil, Farm Credit Services of America, First State Bank, Flower Cart, Foam Catz, Foster Funeral Home, Gilbert Flooring & Paint, Gilbert Jewelers, Good Life RV, Hamilton County Speedway Racing Association (HCSRA), Humes Distributing, Hy-Vee, Integrity Trucking, Iowa’s Favorite Country K97, K.C. Nielson, KQWC Flight Q95, Lambert Lumber, Malvern Bank, Murphy Carpentry, NAPA Auto Parts, Olsen Family, Pepsi Beverages Co., Pizza Hut, Pruismann Painting, Ruba Lawn Care, Seneca Foundry, Spangler Automotive, Stein Heating & Cooling, Tolle Automotive , Tony’s Tire, Town & Country Insurance, The Trash Man, Van Diest Medical Center, Wide Open Race Engines and Windsor Manor Assisted Living.